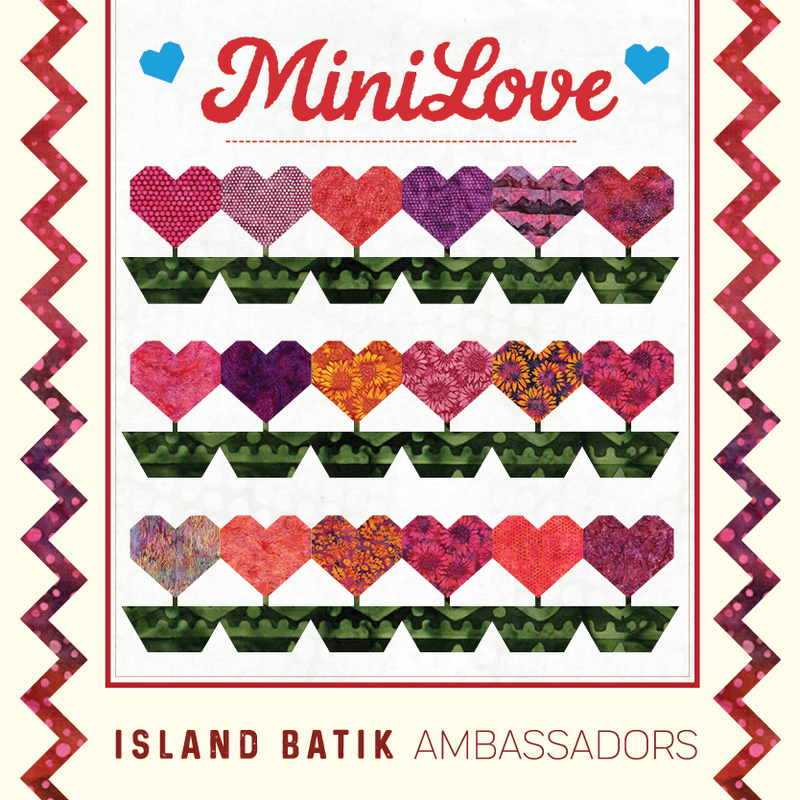 I am continuing on with the heart theme this week, and I have my second February Island Batik Ambassador challenge ready to show you today. (Fabric for this challenge was provided by Island Batik.) 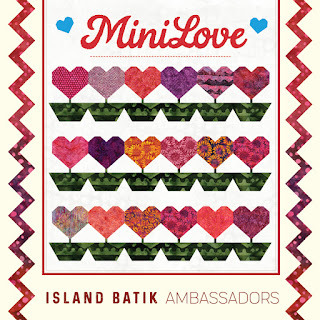 Since the theme of this challenge was Mini Love I decided I wanted to make a mini with a heart theme. I spent some time on pinterest looking for heart quilt ideas, and when I came upon a beautiful pin featuring a quilt by the Temecula Quilt Company I knew the minute I saw it that I wanted to make it! I didn't even blink when I read to make 89 little heart blocks to start out with, I just started cutting squares and rectangles and started sewing! I had some pinks left from last year's Galentine's day fat quarters, plus a few pinks and neutrals from past collections to make my hearts a little more scrappy. The little blocks were so cute as I completed them! Finally, I had a stack of 89 blocks completed. That's when I checked the instructions for the next step and realized that all of my blocks were 1/2 inch too large! Oops! So now I had to spend a little time to trim them all down to the right measurement. Now they were even cuter because they were tinier, though! I cut the alternate squares for the blocks and tossed my hearts in a bin so I could sew them together randomly. I had a bit of a time sewing them all together, I kept ending up with upside down and sideways hearts! Eventually I got the center together, added the small border and sewed one of the side borders. And discovered it was a bit too long! At first I thought I would just trim off the extra, then realized that it wouldn't look very good when I sewed the top border on. I decided to try sewing the other border with a generous 1/4 inch seam allowance instead of the scant 1/4 that I usually use. And it did the trick, the second side was perfect - yay! I removed the first border and resewed the seams between the blocks, which was enough to get it down to the correct size as well. What a different a couple threads makes! The top and bottom border came together almost perfectly - had to fix an upside down block, but other than that, it was smooth sailing! And then I was ready to quilt! I used the 40 wt Ivory thread I received in my Ambassador Box. I decided to do a small stipple all around the hearts. It was a little tricky getting around all those angles! When I was finished, I decided I wanted to wash and dry it to get that nice crinkle look from the cotton batting I used. I love how it finished! And it was really fun to make, too! I just love miniature quilts! I did not give measurements for this because you can find that information on the tutorial I linked to at the top of the page. They have lots of mini patterns, plus free tutorials on their blog as well, so have fun checking that out! I was so happy that I had just enough of the fabric I used in the border to make the binding as well! I loved using the Island Batik fabrics for this mini because there is so little fraying of the fabric, which makes dealing with these small pieces much easier - those little hearts end up being 1 1/2 inches finished, and the quilt is 24 x 24 finished. The fabrics are pinks and reds from various collections. I love a good scrappy quilt! Hope you like my Mini Love Challenge quilt and that you have a lovely Valentine's day! This is so adorable! Man, you had a journey with this one, but it sure was worth it because the end result is so gorgeous. Really shows off those batiks. Good job! Thanks for linking to Wednesday Wait Loss. What a sweet mini quilt! This is the sweetest little mini. Happy Valentine's Day! What a great little quilt! Good use of your leftovers and it truly is adorable. What a lot of love went into this one!! That's adorable. I love it. I may have to make one. What a cute mini! I'm glad you persisted.... all those setbacks sound exactly like the mistakes I make in projects like this. But your result is truly worth it. I hope you enjoy displaying this quilt every Feb for years to come!